GPS Trader is a software said to be created by Richard Hessner, who was a systems developer for Garmin, a GPS company. His brother Josh, was a Wall Street binary options trader making 7 figures a year. Josh had the idea to use GPS systems for higher speed data transfers and took advantage of Richard’s industry contacts and so they went into business together and created GPS Trader which allows them to trade binary options 100% risk-free. 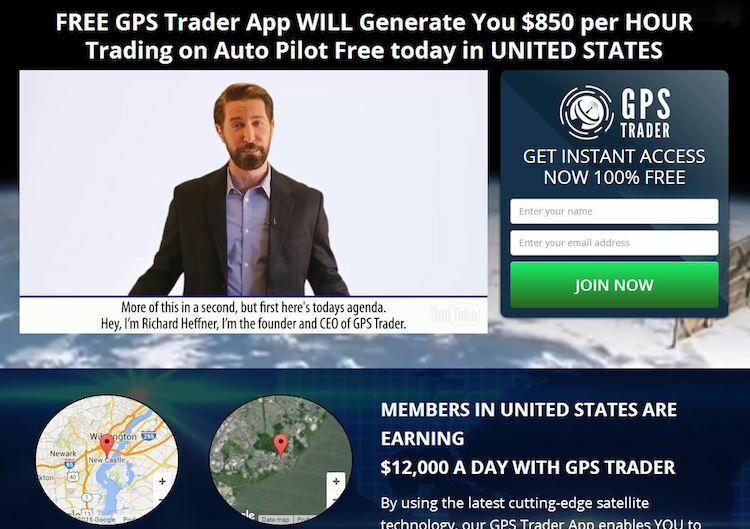 If you want to watch a video full of technological explanations that are worse than those on a C-rated sci-fi movie, then watch the full GPS Trader promotional video here. So is GPS Trader just another scam? Check out our answer below! What is GPS Trader Robot? As you have rightly guessed, GPS Trader is nothing but a silly scam with fantastic claims. Firstly, there is no such thing as risk-free trading, no matter how fast your data is. Make no mistake, if GPS trading was really the fastest way that data can be transferred for trading, Wall Street would have been the first to implement it. Secondly, anybody who claims to be able to make you $20,000 a day risk-free, out of the goodness of his own heart, is lying to you. Mr. Hessner claims he’s able to make an extra 10% on top of your profits, with no mention of where this extra 10% magically appears from. Now let’s move on to Mr. Hessner himself. He is, of course, an actor who has appeared in a few other scam videos as seen below. We also managed to track down Richard Heffner’s real identity, and his name is Patrick Green, an actor from Portland, Oregon. This is no surprise given that most of these lengthy scam videos appear to be filmed in Portland for some reason. And as for Richard’s brother Josh? Unfortunately, the scammers didn’t want to spend additional money on hiring an actor to play Josh so all we have is a stock image instead. Other than paying for Mr. Green to play Mr. Hessner, the scammers did not appear to have spent any more effort after that. There are no fake video testimonials, perhaps they spent their entire production budget on hiring Mr. Green? All these binary options scam robots have the same premise. First, there are the bombastic claims, followed by it being provided to you free of charge, and all you have to do is fund this trading account with our broker! Really these robots are just unethical affiliate marketing vehicles and the scammers get paid the moment you fund your broker account via affiliate commission. Once you realize the robots don’t perform as promised, it’s too late and they have already been paid. GPS Trader is just another scam with not even the slightest attempt to make realistic claims. If you use GPS Trader with a broker they automatically assign to you, it is likely only a matter of time before you end up losing all of your money. There is a good chance that you will lose more than your initial deposit to as account managers at binary options brokers, particularly the more unethical ones, are known to push clients into depositing larger amounts after a loss, selling the promise to win it all back and more. Avoid this whole scam entirely. 7 Binary Options review: GPS Trader Robot: 1 stars.